As experienced players, members of Equinox are keen to encourage budding new saxophonists and support players to develop and progress. 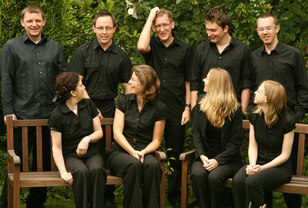 A number of the group teach the sax and other instruments, with teaching practices across the East Midlands. Our wider interest in musical education means that Equinox concerts regularly include an educational element, providing light-hearted introductions to the members of the saxophone family. The group has also taken part in the Kidsophonic Concert at Nottingham’s Albert Hall, aimed at children and their families. Equinox director Alistair Parnell also runs the Nottingham Sax Day, which for the past two years has brought together up to fifty players for masterclasses and ensemble playing. See Diary for information on next year's event. To contact Equinox regarding educational projects or teaching, email Equinox here.